Found that one on ebay, only ships to the US dangnabbit. My brother got me a massive poster of the 'Beatles For Sale ' album cover when I was about 10 and it got pride of place on my walls that were covered in Beatles. I have all of those posters in boxes and have no intention of getting rid of them, some were pretty big as well. That's The Way The Grand Vizier Planned It. Billy is The Fifth Floyd. THERE ARE FIVE FLOYDS ALREADY. 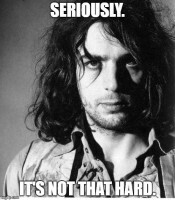 Tut, tut, @Zig... the Crazy Diamond is gravely disappointed in you. That's my point. If there is an extra member, they'd have to be the Sixth Floyd. Not the Fifth. There were already five. ...Though it's not that clean-cut because there were usually four (as in that particular image that iTunes uses), sometimes three, and even two on a couple of occasions. Hey @NickCanadaCore! I just noticed you were online, and thought I'd say hi. You're very welcome! I hope you stick around. Welcome back, @NickCanadaCore. Hope all is fab in your world. Might I also mention that It's been a grand 2 years for me on this forum. Must be some kind of birthday anyway, eh?